The Presidency is still waiting for reports on what transpired between the officials of the Department of State Services and the Economic and Financial Crimes Commission in Abuja on Tuesday. Officials of the sister agencies were involved in a showdown when the EFCC operatives attempted to arrest a former Director General of DSS, Ita Ekpeyong; and a former DG of the National Intelligence Agency, Ambassador Ayo Oke. The issue of the face-off came up at the weekly meeting of the Federal Executive Council presided over by President Muhammadu Buhari on Wednesday. A cabinet member, who spoke on condition of anonymity, told Punch that council members resolved that the issue could only be handled properly after the submission of official reports by the agencies. The heads of the two agencies are not members of FEC. He said, “The issue came up during the ‘Any Other Business’ segment of the council meeting today (Wednesday). The truth of the matter is that as of the time of the meeting, the only information available to the government on the issue was the media report on the matter. “Government’s business is not operated in that manner. So, the resolution was that we will wait for official reports from the affected agencies. But the Chairman, Presidential Advisory Committee Against Corruption, Prof. Itse Sagay (SAN), advised Magu to report what transpired between the EFCC and officials of the DSS to the President. Sagay, in an interview with one of our correspondents on Wednesday, said Magu should write a letter on the clash between the EFCC and the DSS to Buhari. 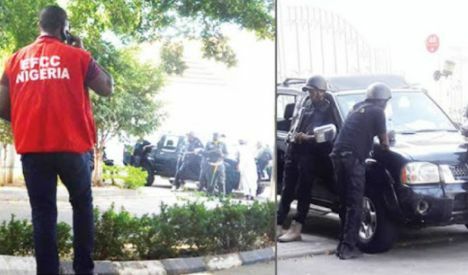 Officials of the DSS and EFCC were involved in a showdown for over 13 hours on Tuesday when the EFCC operatives arrived at the homes of a former Director General of the DSS, Ita Ekpenyong, and an ex-boss of the National Intelligence Agency, Ayo Oke, to arrest them. Ekpenyong, who served as the head of the DSS from 2010 to 2015, had been invited by the EFCC for his alleged role in the arms scam involving a former National Security Adviser, Col. Sambo Dasuki (retd. ), and other service chiefs who have since been arraigned. The PACAC chairman also described the fiasco as unfortunate, adding that no one was above the law. Sagay said, “We all know that the law empowers the EFCC to investigate, arrest and prosecute and they have the right to interrogate and invite you and if you refuse to come, they can arrest you. So, anybody, who refuses, that is engaging in lawlessness and is trying to turn the country into a chaotic state of lawlessness which is certainly not good for the country. Sagay disagreed with those saying the EFCC should have written to the DSS before attempting to arrest the former DG. On his part, a human rights lawyer, Femi Falana (SAN), berated the DSS for obstructing the EFCC. He further stated that the incident should not be treated as a mere ‘inter-agency face-off’ but a flagrant disregard for court orders. The activist said since the Presidency had said the EFCC was free to investigate the former NIA boss, the DSS had no reason to prevent the anti-graft agency from doing its work. Also civil rights groups described as shameful, the clash between the officers of DSS and the EFCC. But a former Director of the DSS, Mr. Mike Ejiofor, said the EFCC had no right to investigate how the DSS funds were spent. He said the Act establishing the DSS clearly stated that only the President could investigate the agency. Ejiofor said, “I don’t have a problem investigating anybody but due process must be followed. By the DSS Instrument 1 of 1999, no person or agency is empowered to investigate the spending or operational matter of the DSS except the President. It is only the President that can ask for investigation. The DSS makes returns of its spending to the President annually. “I am surprised with what is happening. We have never had it before. He (Magu) has no power or mandate to investigate the spending of the DSS. It is not done anywhere in the world. Meanwhile, Magu has said there is no going back on the planned arrest of Ekpeyong and Oke. He said nobody, no matter how highly placed, was above the law of the land. The EFCC boss spoke after he attended the inauguration of the Audit Committee on the Recovery and Management of Stolen Assets within and Outside Nigeria at the Presidential Villa, Abuja. He claimed that the commission had concrete evidence against the former DSS and NIA heads. “There must be reasons, strong reasons before we go for an arrest. Never, Never, I am not discouraged at all, rather, it energises me to do more and I am telling you, nobody is above the law,” Magu said. He said he was not discouraged by the Tuesday face-off between his men and DSS officials. On Wednesday, the DSS kept mum on the refusal of its operatives to allow the EFCC officials to arrest Ekpeyong and Oke. But a security source said the EFCC was prevented from arresting Ekpeyong because the anti-graft agency did not follow the due process. The source stated that the EFCC ought to have written to the DSS on the invitation of Ekpeyong. “The EFCC knows that the DSS operatives are guarding Ekpeyong. The normal thing is for it to write to the EFCC, instead of resorting to lawlessness. The anti-graft agency should learn to embrace the rule of law,” the DSS source said.